See the star's trim new look. When HGTV star Ben Napier recently returned for the third season of "Home Town," viewers may have noticed he looks a bit different. 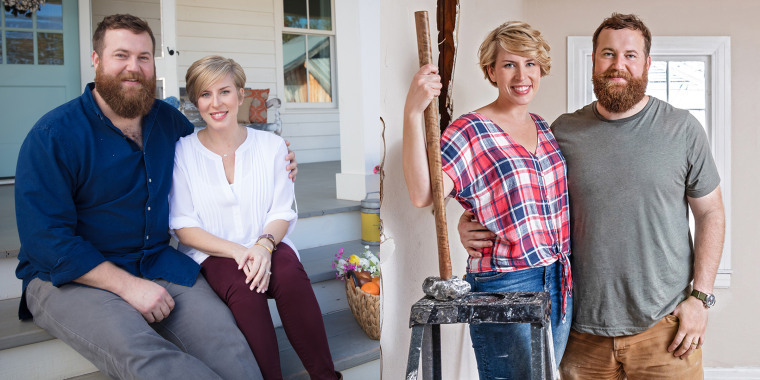 That's because the home renovation expert has dropped an impressive 55 pounds over the course of the last year, all in the midst of becoming a new father and working hard on "Home Town" with his wife, Erin. No big deal, right? Health has always been at the forefront of Napier's mind, but he told TODAY Home the timing simply felt right to make a major change. "I started getting back on the wagon last January — I think most of us do during that time of year. The combination of Season 2 filming wrapping up, the holidays and then having a newborn meant that I had really overindulged and had put on more weight than I normally would during the holidays. So I had to really work on it," he said. This isn't the first time the master woodworker has unveiled an impressive weight loss. Seven years ago, Napier trimmed down to 260 pounds — his lightest weight since college. Then life intervened, and Napier's weight consistently hovered between 290-300. After his daughter, Helen, was born last year, Napier said that all things changed for the better. "Bringing Helen home and getting to experience those first few weeks with her and seeing how fast things change with children, it got my attention. She was different every day, and I want to experience as much of her life as possible. I want a long life so I can be there for Erin and Helen," he said. And he's feeling better than ever, too. "The most rewarding part was my body feeling better. I hurt my ankle really badly a few years ago. It's a nagging pain that was bothering me every day. After losing the weight, it doesn't bother me as much. Little things like that have been incredible," he said. So, how has the busy father dropped (and kept off) the weight? It's pretty simple, actually. "I've always done well with cutting carbs. I try to stick to a low-carb diet until Thanksgiving every year and I try to do a good mix of cardio and weights five days a week. Most weeks, it ends up only being four days," he said. Napier has also added basketball to his cardio routine and started watching his calories. "I don't get bored playing basketball, and could play for hours if I had the time. I've also done some intermittent fasting a couple of days a week," he said. The 6-foot-6-inch HGTV star has also strategically avoided those tempting on-set snacks. "The most challenging part has been the craft services (the snack table on set) at work and catered lunches. Fifteen years ago, you give me snacks all day and a catered lunch, I'd be in heaven, but while filming Season 3, it was torture," he said. Over the course of the new season, Napier's weight will even fluctuate from scene to scene during certain episodes, since some portions ended up being re-shot due to weather. And Napier is interested to see if fans pick up on the not-so-subtle changes in his physique. "I'd warn our show runner and our director that I was 30 pounds lighter than the day we shot that originally, and that my clothes would fit differently. They'd just laugh and say, 'Well, this one will be for the nerds,' like maybe only the really eagle-eyed viewer will notice. Typically, we leave it to the nerds if Erin's hair is a little different or something. I think the non-nerds are going to spot this though," he said. As any couple knows, a weight-loss journey affects both parties, and Erin Napier was there to support him every step of the way, especially in the kitchen. "He eats a lot of protein, and I eat a lot of carbs. So at night, rather than tempt him with the foods I know he missed, I would always eat something I know he didn't care for (like cereal) and make an omelet for him," she said. His on-and-off-screen partner is pretty darn impressed with her hubby's weight loss, but is quick to point out that she's always had the hots for him. "Oh I've had this wild crush on him since the first time I saw him, and that doesn't change with his weight. I love the way he carries himself, being such a big guy, the way it makes you feel comforted just having him close," she said. Since her husband has a family history of heart disease, however, she has always been a bit nervous about future health issues. "I used to have this recurring dream that we go to the doctor and he tells us Ben's heart is failing and he doesn't have much time left. In one dream, I threw a 'going away' party for him where everyone he'd ever known came to send him off, to say their goodbyes, and I kept my arms around him, my ear to his chest so I could hear the steady beat of his heart. I would wake up in a cold sweat with tears in my eyes," she said. Nowadays, when she hears the sound of a basketball bouncing off the driveway — even if it's as early as 4:30 a.m. — she doesn't complain one little bit. "Every time I hear that ball bounce, I think of his heart beating so fast and staying strong, and I imagine us old and gray together. That makes me really happy," she said.